The all new Triumph Rotary Trimmer line has been known for years as the Ideal-MBM Kutrimmer brand. Included in the new line-up of re-branded Triumph models, these small to medium duty class models include: 1030, 1031, 0055, 0075 and the 0105U. With professional features and the same sturdy construction & design - these Triumph Rotary Trimmers exceed expectations! High quality and precision self sharpening blades come standard on all models. 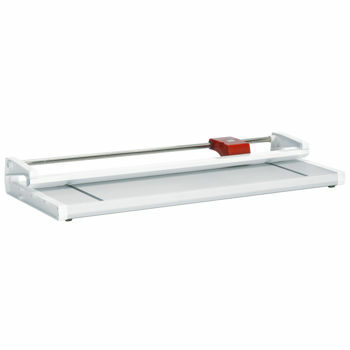 Other standard features include: automatic paper clamps, non-slip rubber feet and guides & measures, and sturdy impact resistant ABS plastic or metal base plates. Cutting paper with these rotary models has never been so easy! The Triumph 0055 is a 21 1/2" rotary trimmer built with high quality and performance in mind. 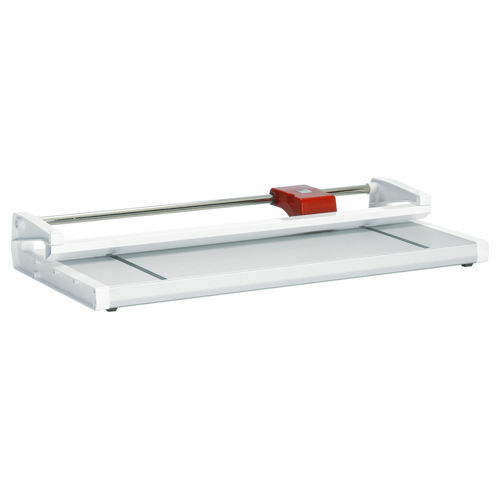 Designed with anodized aluminum cutting table, complete with dual measurement scales - it's an excellent model for cutting. Designed for cutting & trimming use in a variety of settings, including: print shops, graphics design departments, architectural studios, classrooms and schools, print offset / letterpress / lithography and digital production houses, home / scrap-booking / hobby, photo studios and much more! The Triumph 0075 is a mid range wide 29 1/2" rotary trimmer designed for cutting paper accurately. Designed for commercial and professionals alike, it's anodized aluminum cutting surface will last for years! The cutting head on the Triumph 0075 slides easily on a precision cross bar while the transparent automatic clamp holds photos and prints in place. When trimming paper, thin plastics & vinyls, photos and other print material - you'll be sure to get the job done right. 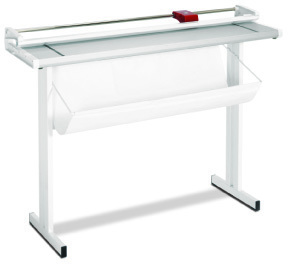 Wide format trimming is a breeze with the all new Triumph 0105u rotary trimmer & stand. The ultra-wide 41 1/4" cutting width will come in handy for a variety of cutting tasks. Included standard with this Triumph is a sturdy metal stand and waste collection tray. Designed for professional print shops, photography, architectural firms or city planning departments, the unobtrusive design can fit neatly into any corner of the print shop.